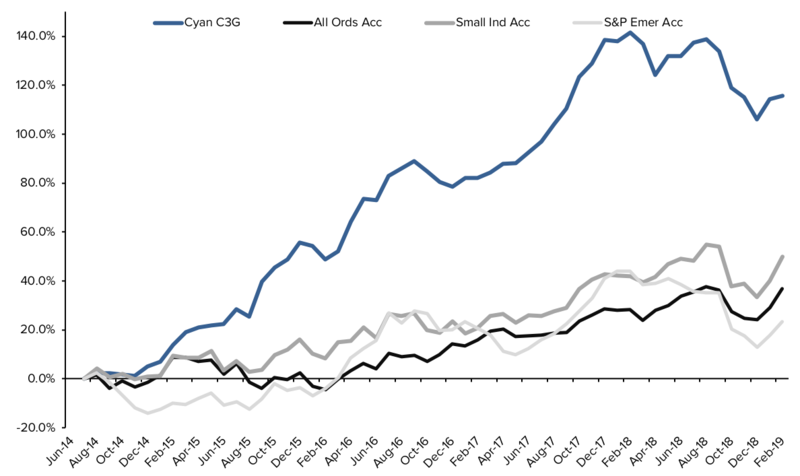 The Cyan C3G Fund posted a modest gain of 0.6% in February, following on from a 4.0% rise in January 2019. After the worst quarter in over 10 years at the end of 2018, the ASX All Ords continued its 2019 rebound with a good gain of 6.1% in February. Volatility was as acute as we can recall with the renewed interest (and net buying) in ASX equities exacerbated by a patchy reporting season. As always, this was more pointed at the smaller end of the market with the share-prices of at least 25 of the 150 odd members of the Small Industrials index moving more than 20% in February. Winners such as Appen, Breville and Lovisa (all up over 40%) were negated by disappointments such as Blackmores, Pact Group and Bingo (all down over 20%). It was a similar situation in the Cyan C3G Fund with 8 of our 25 positions moving in excess of 20% in February. Splitit (SPT +58%) – has similar drivers to Afterpay but is much earlier in its lifecycle phase and has a slightly different target market and markedly different business model with the bulk of their merchant client base being outside of Australia. We invested a relatively small amount in the IPO of the company, which has been embraced strongly by the market since listing at the end of January 2019. Experience Co (EXP +22%) – oddly enough, one of our best performers this month navigated an earnings downgrade in early February. This Queensland and NZ centric adventure tourism company has been beset by incredibly poor weather in QLD of late so the pull-back in earnings expectations was certainly of little surprise. However the business has struggled to effectively integrate some recent acquisitions which has prompted management changes (including a new CEO and CFO) that, clearly, the market has embraced. Certainly our meeting with the company Chairman and new CFO during February solidified our decision to stick with the business. another stunning half year result that reported customer numbers increasing by over 100% to 3.1m and total revenues rising 124% to $107m. Murray River Group (MRG -20%): Organic fruit producer MRG had a 58% rise in January so some short-term pullback was not entirely unexpected. Of course the ~10c share price combined with 0.5c ASX trading increments adds to the volatility. MRG reported its first result with the new management team in place and the positive changes we had been expecting to see – such as farming and manufacturing efficiencies, contract re-negotiations and price increases – are occurring. Whilst the business is yet to become profitable the signs are emerging that this investment will be a rewarding one for our unitholders. Motorcycle Holdings (MTO – 28%) – automobile and motorcycle sales have had their worst period in more than 10 years and, unfortunately, MTO’s reliance on the premium Harley Davidson brand has been hit harder than most. MTO has fallen more than 70% from its recent peaks but this has been as much to do with the market’s re-rating of the stock as it has with the pull back in earnings. (MTO’s forecast FY19 NPAT has been pared back by 35% to $11m). With a PE of just 8x on potentially bottom-of-the-cycle earnings, we believe the risk-reward equation falls firmly in our favour. We don’t think it’s any exaggeration to say the that the market tone has done a complete 180° since Christmas. We certainly would have liked to have participated in more upside in recent weeks but we always maintain a considerable focus on risk. Even in hindsight, we felt the market was overly volatile to have been fully invested at the end of 2018. What we have seen in the past couple of weeks is some new and attractive opportunities emerge at the smaller-end of the market. We have added a couple of new and exciting positions to the portfolio and we feel that positive and unexpected (or undiscovered) company performances will be well-rewarded. Certainly there is a back-log of corporate activity from late 2018 that is flowing onto our shores post-reporting season and that is likely to provide further opportunity to generate value for our unit-holders. We thank all our investors for your support and look forward to keeping you all updated with the Fund’s progress. As always we are contactable directly and encourage you to do so if you have any questions for us.